This post is sponsored by Schick Hydro. Schick Hydro is a complete skin comfort system that refreshes, renews and cares for men’s skin by reducing irritation and hydrating throughout each shave. The bold, new designs of Schick Hydro Blast razors combine with an innovative new travel case so men don’t have to sacrifice a great shave when they’re on the go – they can free their skin wherever they are. Why not buy the complete line for a well-traveled dad for Father’s Day? Schick Hydro 5 Blast Razor with Travel Case: Hydrates and protects skin throughout each shave. 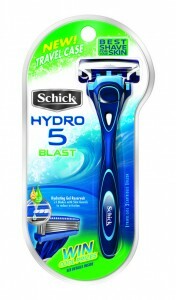 Schick Hydro 3 Blast Razor with Travel Case: Uses a water-activated gel to keep skin lubricated. Both razors feature skin guards, an advanced hydrating gel reservoir, travel case, new handle and flip trimmer. They are available at food, drug and mass stores nationwide for a suggested retail price of $7.99 – 8.99. Schick Hydro Sensitive and Moisturizing Shave Gel: Designed to work with and enhance the performance of the Schick Hydro Blast razors, Schick Hydro Sensitive and Moisturizing Shave Gels help to deliver maximum closeness and comfort. They are available at food, drug and mass stores nationwide for a suggested retail price of $3.39. For more information, visit www.schickhydro.com. GIVEAWAY ALERT: Cupid’s Pulse has teamed up with Schick to give away two sets of each product to two lucky readers! To enter, tell us how your on-the-go guy could use this set comment below. Please be sure to use your real email address so we have a way of contacting you if you’ve won – don’t worry, your address won’t be shown. If your email is not included you will automatically be ineligible to win. This giveaway will run until 11:59 PM EST on Saturday, June 18. Good luck!